A flexiloop carrier is similar to the vari-gauge and patch handled carrier bags, but with a welded polythene loop handle attached. A flexiloop handle is an ideal solution to add a little more class to a polythene carrier bag. For UK manufactured quantities over 10,000 an optional turn over top can be incorporated into the bag (if required for strength). Other than a turnover top, the vari-gauge material can be used. Colour of the loop does not have to be the same as that of the carrier. 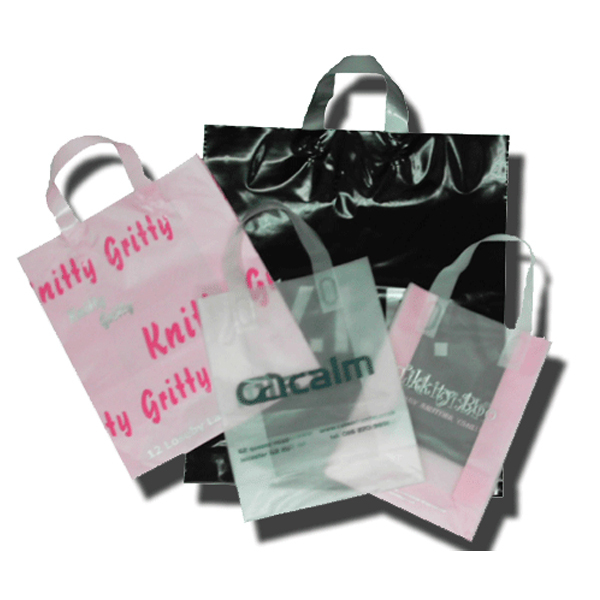 Flexiloop carrier bags can also be manufactured with a side and base gusset, cardboard top and base reinforcements, long or short handles and printed up to 100% (not all styles can be printed 100%). available sizes: From 12x18+3" up to 20x22+5"
Beckdale.co.uk offer a design service for exhibition flexible loop handle bags. Our in house office team are happy to help stores choose bespoke flexible loop handle bags. For choose by material or different styles of , contact Beckdale via your preferred method.